Dead Fish Restaurant, Crockett, California. 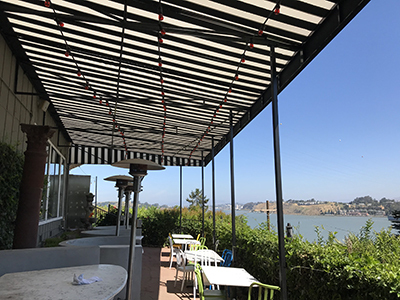 Custom canopy frame and covers designed for irregular-shaped patio providing more seating while taking in fabulous view. Welded stripes are one of our specialties! Van Ness Ave. residence, San Francisco. 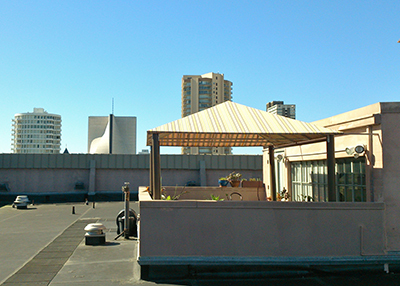 Rooftop custom frame canopy to provide shade on outdoor patio. 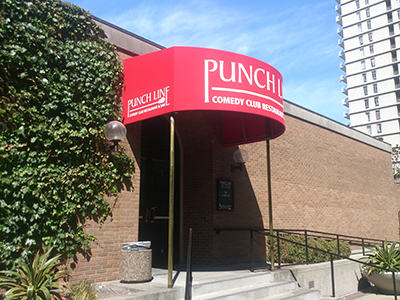 Punchline Comedy Club, San Francisco. Complete replacement of frame and cover. 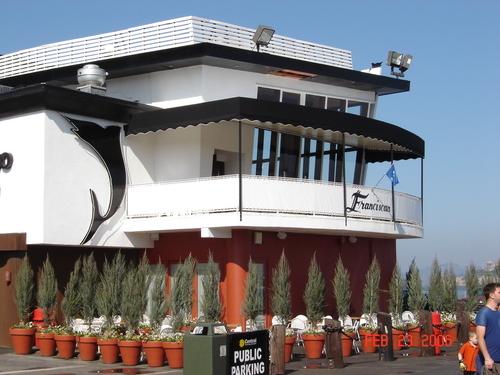 The outdoor deck at the Franciscan Restaurant on the waterfront has a great view but is exposed to sun, wind and salt spray, which limited its use. By adding a canopy, enough shade was created so the deck can be used during lunch, creating an exceptional dining experience. At night, the canopy keeps guests comfortable by retaining the warmth from outdoor heaters. Adding railing curtains helps control the wind on those brilliant but gusty San Francisco days and helps keep the glassware on the table. We can transform your deck or patio to create a comfortable outdoor space for entertaining for most of the year. Traditional Box style canopy with closed top. Very slight slope on top to drain rain water. Flat ceiling panel with built in lights. Brass sleeve poles at front. Standard size is 3". Also available are 2" to 8" diameter. 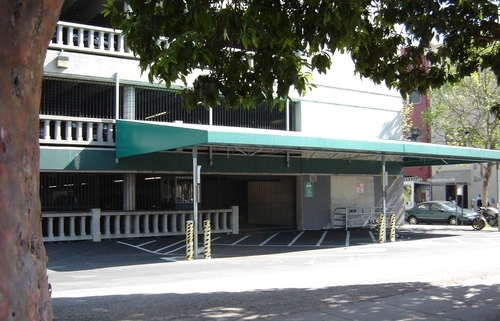 Large carport canopy. Lean to style supported by building on one side. This canopy is the half round style with a dome front and brass poles. The horizontal stripes and building number are on a fixed valance. 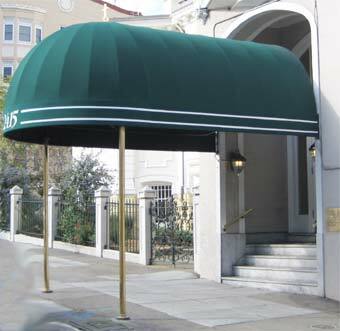 Elegant San Francisco entrance canopies shield residents and visitors from winter rain and summer sun. Business names and logos can be highlighted in many styles ranging from simple lettering to dramatic cutouts with contrasting fabric. We can do metallic letters, raised letters and unique logos and designs. 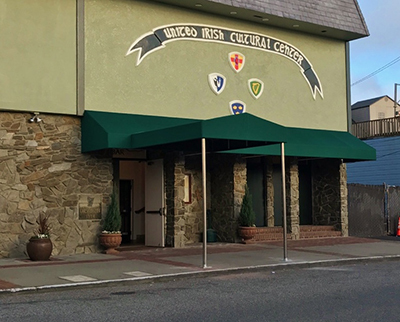 We can work with CAD design files to make a distinctive entrance canopy for your business. A canopy can be enhanced with a scalloped loose valance below the fixed valance. 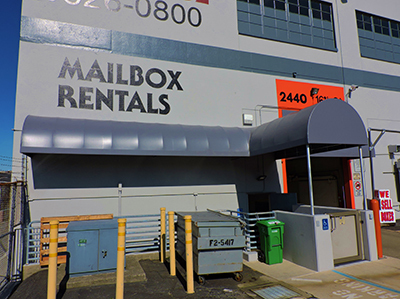 We recommend a fixed valance on canopies to eliminate frame sag between the building and front posts. A fixed valance creates a truss to support the frame without sag. The solid color and restrained white stripe create a formal look appropriate to the City. 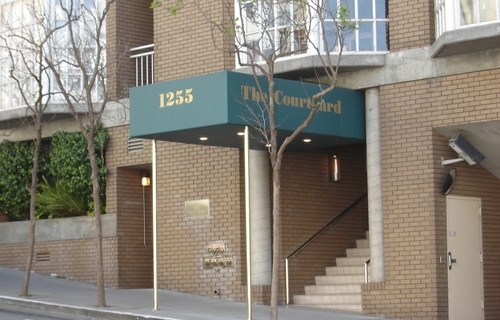 The dome shape echoes the graceful curve of the tall San Francisco entryway. 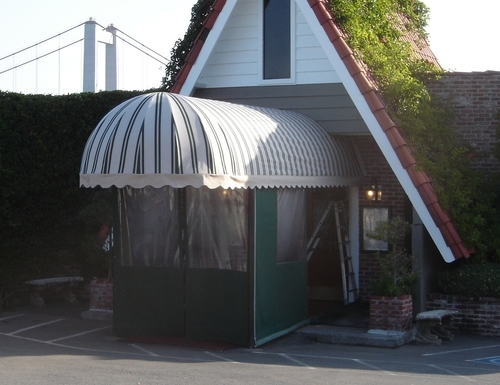 Tim McGill brings generations of experience to awning and canopy design.